This is a must-have read for anyone looking to take their independently-produced film or video into the 3rd dimension. The text features technical, practical, and inspirational insight from the visionaries who’ve been producing 3D film and video for decades, not just in the recent past. They offer low-cost techniques and tricks they’ve been implementing themselves for years. A variety of styles are discussed, from full CG to time lapse – even a film made during a freefall skydive jump! The filmmakers discuss: options for on-set playback; preparing for final playback in various formats; adapting existing technology to your needs; post production software choices; and, working with computer graphics in 3D. This book includes 3D glasses and a companion YouTube channel featuring the work of the filmmakers featured in the book (which you can view in 3D with the glasses), as well as the opportunity for you to upload your own videos for critique and feedback from the author and others. 3D glasses are not included in the purchase of the e-book of 3-DIY. If you have purchased the e-book, and would like a pair of 3D glasses, please contact the publisher. 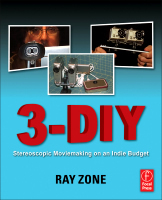 It also includes: Technical and inspirational advice and instruction on how to get the best 3D-bang for your buck when working on an indie budget; and insight from the vanguard of the stereoscopic 3D moviemaking community, with decades of sage wisdom lacing each page, and all in full-color. The companion YouTube channel features stereoscopically displayed 3D movies you can watch with the glasses that come with the book, and also offers you the opportunity to post your own movies and videos, with critique and suggestions from viewers and contributors to the book.